Genuine replacement battery for the evergreen Plantronics CS60 wireless headset. If your headset is losing its charge too quick, then it's probably due for a change. For best performance, it is recommended that these batteries be changed every 2 years. Tests have shown the battery to give up to 9 hours of talk time on a full charge. When the unit is in standby mode, the battery will last up to 30 hours, and will fully recharge in three hours when docked in the base unit. Leaving the headset docked when not in use does not reduce battery life. Part no: 64399-01 - Replacement Battery for your Plantronics CS60 wireless headset. 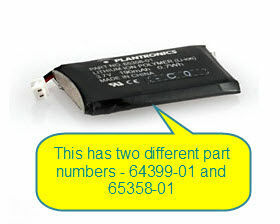 You may find part code 65358-01 on your battery - both are fully compatible, genuine Plantronics batteries.